Tim Kaufman of FatManRants was diagnosed with Ehlers-Danlos syndrome (EDS) in his early twenties. He was in chronic pain most of his life. By the time he had reached the age of 37 he was addicted to Fentynal, alcohol, and fast food. At over 400 pounds he was unable to perform simple daily tasks. He had many chronic health issues and was almost immobile. He had lost his interest in life and had almost given up. Tim started a journey to regain his health. He started to change one small thing at a time. He is now an athlete that thrives on a plant-based whole food lifestyle and leads a healthy, happy, productive, and very active life that is free of all medications he was once on. 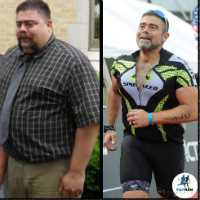 His passion is to spread the message that anyone can transition to a healthy, active lifestyle and dramatically change their life regardless of their current situation or size. Tim has appeared on Podcasts from around the world and has been filmed for upcoming movies. He has been featured in Runners World Magazine, Good Morning America, Today, People, The Buffalo Newspaper, and many other media outlets. Tim uses his platform as an international speaker to educate, inform and motivate people about plant-based nutrition, fitness, addiction recovery, overcoming physical challenges, and emotional and spiritual wellness.